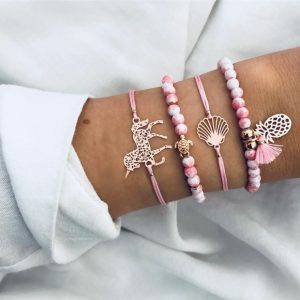 Brighten up your outfit with our beautiful ibiza bracelets. The ibiza bracelets are available in various lovely colors. With beautiful beads, shells, feathers and charms. 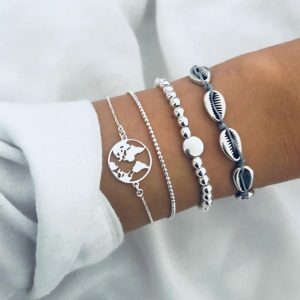 This bracelets set consists of two beautiful bracelets. 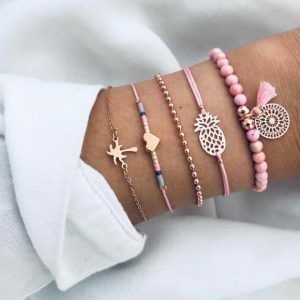 Mix and match it with other nice bracelets for an arm party. 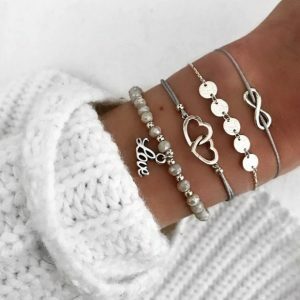 Complete your look with silver jewelry. For example with a subtle necklace with a turtle pendant or a nice compass ring. ???? 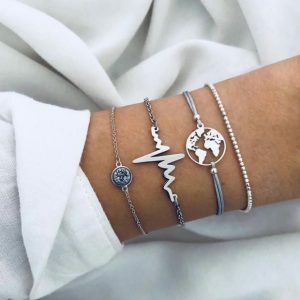 Do you have questions about this 2 piece bracelets set? please send us a message. In our jewelry collection we have beautiful ibiza bracelets. The ibiza bracelets are characterized by their striking design. 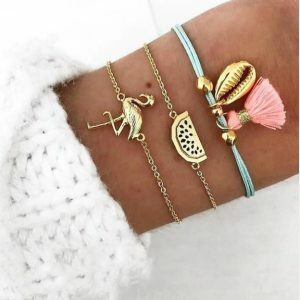 Usually it is beaded bracelet and rope bracelet with playful design. They are summer style jewelry, usually with tassels and shells. They are perfect to brighten up your outfit. We have ibiza bracelets in different colors such as pink, blue, yellow and other beautiful colors. The ibiza bracelets are perfect to combine with other nice arm candy. The ibiza bracelets have been very popular in recent years. 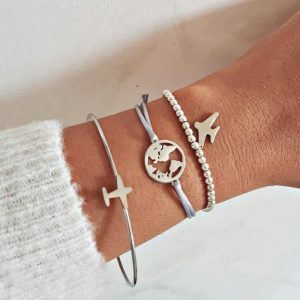 Our ibiza bracelets are elastic so they fit easily around your wrist. We have armcandy in different shapes and sizes. They are always according to the latest trends, you always look fashionable with our ibiza bracelets. You can easily find this beautiful jewelry with dresses, tunics and t-shirts. They add nice color to your outfit! In addition to ibiza bracelets, we also have other beautiful jewelry for women. In the summer you naturally add more color to your outfit. But even in winter it can brighten up an outfit with dark colors. 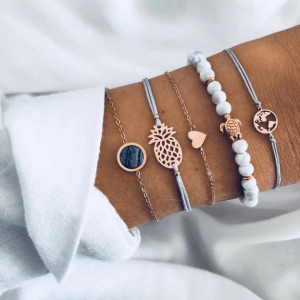 You can easily combine your ibiza bracelets with other jewelry. For example with a nice ibiza necklace. The ibiza necklace is characterized by its striking cheerful design. It is full of colorful beads, shells, stones, feathers, charms and tassels. An ibiza necklace with should not be missing in your suitcase when you go on vacation. Do you prefer subtle jewelry. Then the subtle ibiza bracelets are perfect for you. They are available in the colors silver and gold. 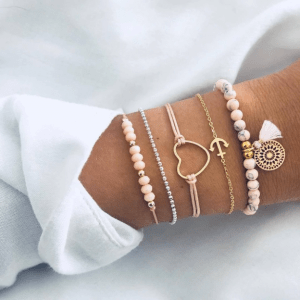 By wearing multiple boho style bracelets you can make your own arm party. A beautiful piece of jewelry also makes the perfect gift to give to your girlfriend, sister, mother or daughter. For example, a birthday, mother’s day, Christmas day, Valentine’s Day or just like that. To show how much you love that person. By seeing and wearing the ibiza bracelets you get a wonderful summer feeling. Combine it with other nice jewelry from Aphrodite. We have beautiful eye-catching earrings with pendants. Small earrings and drop earrings. By wearing several nice earrings together you can easily create your own earparty! Do you have 2, 3, 4 or more ear holes? then you are lucky! We have beautiful earrings sets that you can easily mix and match with each other. 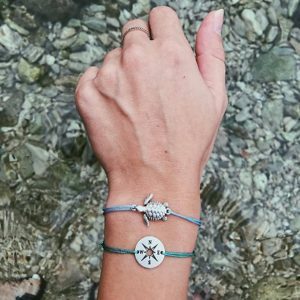 For a stylish outfit you naturally need trendy jewelry. Combine your new ibiza style bracelet with a beautiful layer necklace from Aphrodite. These layered necklace are available in the colors silver and gold. Especially the double necklace with coins are very popular. We also have beautiful subtle necklaces with nice pendants. We also have trendy rings in our collection. In our must have jewelry webshop you will find nice jewelry that suits you. Your ibiza style outfit is really complete after you combine your ibiza bracelet with trendy ibiza style jewelry. Do you want to stay informed of the latest trends and jewelry? Then sign up for our newsletter. Follow us on social media, facebook and instagram. Combine it with other nice jewelry from Aphrodite. We have beautiful eye-catching earrings with pendants. Small earrings and earrings. By wearing several nice earrings together you can easily create your own earparty! Do you have 2, 3, 4 or more ear holes? then you are lucky! We have beautiful earrings sets that you can easily mix and match with each other. 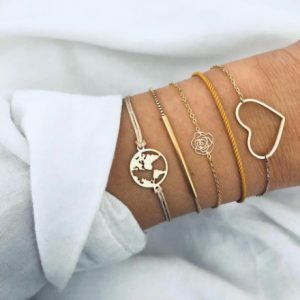 For a stylish outfit you naturally need trendy jewelry. Combine your new ibiza style bracelet with a beautiful layered necklace from Aphrodite. These layered necklace are available in the colors silver and gold. Especially the double necklace with coins are very popular. We also have beautiful subtle necklaces with nice pendants.